FILE - Supporters of Venezuela's President Nicolas Maduro take part in a rally in support of the government in Caracas, Venezuela, March 16, 2019. U.S. and Russian diplomats are meeting in Rome this week to discuss "the deteriorating situation in Venezuela." For Russia, Venezuelan President Nicolas Maduro remains the country's only legitimate leader. Russian officials are expected to emphasize this point when they meet with U.S. special envoy for Venezuela Elliott Abrams in Rome on Monday and Tuesday. The U.S. and some 50 other nations have recognized opposition leader Juan Guaido as Venezuela's interim president. Russia is to reiterate its position that a U.S. military intervention in the South American country would be inappropriate, deputy foreign minister Sergei Ryabkov told the Interfax news agency on Sunday. FILE - Russian Deputy Foreign Minister Sergei Ryabkov speaks during a news conference in Moscow, Russia, Feb. 7, 2019. 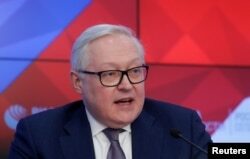 Ryabkov reportedly also said the Russian government will continue to cooperate with Venezuela in a number of sectors, including energy and military expertise, regardless of U.S. pressure. Russia and other nations say sanctions imposed by the U.S. are only hurting the population. Russia has sent food and medical aid to Venezuela, helping the Maduro government bypass the sanctions. Abrams has defended the sanctions, saying they are only a temporary measure. "The purpose is to motivate people to change their behavior," he said. "So while we impose sanctions of visa revocations, we make it very clear this is reversible if people's pattern of conduct changes. It's not just a punishment, we hope it is also an inducement to a changed pattern of behavior." 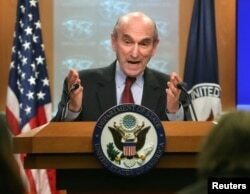 FILE - U.S. Special Representative for Venezuela, Elliott Abrams, briefs the media on the current situation in the country, at the Department of State in Washington, D.C., March 8, 2019. Abrams has also dismissed Maduro's claims that opposition leader Guaido is a collaborator in a U.S. coup plot. "The allegation that Juan Guaido is some kind of a puppet of the United States I think is first ridiculous and second has been disproved in a number of ways. One of them is the number of countries that support him," the U.S. envoy said. For Abrams, Maduro is responsible for the crisis in the country and must go. "This economic decline is not new," Abrams said. "The situation in Venezuela now is a product of years of corruption and incompetence and venality on the part of this regime. That's the problem, and the solution is to replace it with a democratic government that is actually responsive to the needs of the people." On Friday, Venezuela created a unit tasked with protecting basic installations and services such as electricity and water, a week after a massive blackout. Maduro now plans "a deep restructuring" of his government, according to Vice President Delcy Rodriguez.